On August 14, a challenge match will be played between the Chinese national team and an international all-star team in Wuhan, China. Each match will be played using best-of-5, 11-point game format All 5 matches will be played, regardless of team score. This event is organized by Xu Shaofa’s sporting goods company, and will be televised live in China. Coach Yin Xiao told reporters that other than the Wang-Waldner match-up, the matches are very even, and Liu Guozheng is probably favored to lose to Boll, given Liu’s injury. All the Chinese players will be using unhidden serves. Grubba will be the coach of the international all-star team. "The biggest difference is that as an athlete, I only have to take care of myself, but as a coach, I have to take care of my players", said Liu Guoliang. The national team announced that Liu will become an assistant coach for the team. Liu talked to reporters after a Super League match in Shanghai, after the announcement was made. "I am lucky that I do not have to leave China to make a living like the players from the older generation. I do not have to embark on a path that leads to money but holds no dreams. Due to the market efforts of the CTTA, the Chinese players now have been able to save some money. I can afford to choose my profession according to what I want to do. 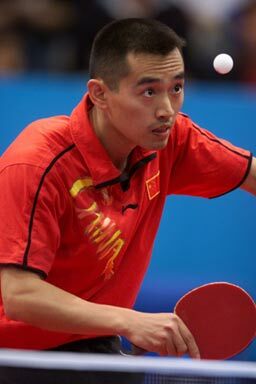 I love table-tennis; it is a lifelong career for me", Liu said. Liu told reporters that he is making adjustments now. First he has to manage his time, and he will increase his coaching activities and cut back on his playing. "My strength is in the professional area: how to adapt at the court and to adjust the mental attitude. My weakness is a lack of general knowledge", Liu said. He stated that he lacks cultural knowledge, and he plans to attend a university in Beijing to strengthen that area and to learn sports management. If there is no suitable university in Beijing, he would choose Jiaotung University in Shanghai. When asked about the penholder pips-out style, Liu expressed some regret. "Now the little kids are mostly playing shakehand. Very few of them want to try the pips-out penholder style. This style requires courage, but that does not mean it does not have opportunities. They key is finding someone who would give it a try", Liu said. Reporter: We believe you have an excellent understanding of how to play against the penholder style. Can you share with us your experiences? 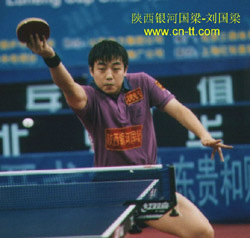 Kong Linghui: Penholders in general have weaker backhands, although the Chinese are different than the foreign players in this respect. Our players have added the reverse backhand loop to their skills, and that certainly has helped them initiate attacks on the backhand side. Also, the Chinese penholders are strong in 3rd ball attacks, and they are more "venomous" with their attacks. They are weaker in rallying, but have very refined first-3-ball skills. Most penholders are in Asia, and players from countries like Korea tend to be one-sided loopers, and have relatively greater weakness on their backhand side. R: How does your strategy differ when you play Ma Lin, compared to playing Kim Taek Soo or Chiang Peng Lung? K: There are definite differences. I play Ma Lin a lot, and we are very familiar with each other. The Chinese players use different sponges, and they are a little more awkward for me to play against. Chiang is also quite different from Kim. Chiang has good blocks, and is not the one-sided inverted looper that Kim is. Kim blocks and smashes with his backhand, but his main weapon is the forehand. So everyone is a little different. In general, players like Chiang do not have the rallying abilities of the shakehanders, and their ability to initiate attacks or create spins on their backhand is weaker. R: When you play Chiang, where do you place your shots? K: It depends, and usually against penholders we attack the right side and then the left because they are strong in stepping around from their backhand position, and they are relatively weaker on their forehand side. That means their power is little weaker from their forehand side. If you can return that shot to their backhand, you would have the advantage. Of course it depends on actual conditions. If you cannot stop their attacks from their forehand side, you would be under pressure. R: I feel that when you play against players like Ma Lin, you usually flip with your backhand, and follow that with a backhand counter or quick loop. You are very quick with that backhand shot, and when the opponent forced a step-around shot, that would not be a high quality one. Then you would seize control of the point by attacking their forehand or counter-looping their weaker loops. K: In general, if I could do that, then it would be great. But your opponent will definitely try to limit you and not let you play your strategy; he would not want to get into a rallying stage, and instead try to use his first-3-ball skills to control you. In a match, we are always trying to control and limit each other. In the rallying phase, the shakehand style is a little stronger, but you need to be able to return serves well to get there. To control the penholders you need to return serves with varied placements: this limits the power and the usage of the penholders’ 3rd ball attacks, and much improves your chances. But if you cannot do that, then you may not be able to play the rallying game. R: I remember one time when you played Ma Lin, he would step around as soon as you flipped the ball, and not wait for your backhand counter. Was that a breakthrough for him? K: Yes, that's because he is familiar with my style, and can predict my placements and spin variations. So he could start moving earlier. Against less familiar opponents, he would need to be a little conservative until he feels things out. R: I feel that Ma Lin’s step-around forehand loops down the line pose a greater threat to you, is that correct? K: Strong loops down the line are a threat to everyone. Kim Taek Soo also does that a lot. In general, penholders have greater abilities to step around and loop from the backhand position. R: Ma seems to avoid your backhand, and instead attack down the line a lot. K: That depends on the quality of my returns. If I handle my forehand side well, he would choose other lines of attack, for example to my middle or cross-court. In general penholders now loop down the line more frequently, including from the forehand side, because that poses a bigger threat. R: I feel that you block off the cross-court shots very well. K: Not necessarily. Once you are in a match, and have played a couple of games, you will understand your opponent's basic looping lanes. In the beginning you would need to cover the whole table, but after a while you can predict where the shots will be placed by observing the patterns. K: In high level competition that won’t work. Because players now can step around and attack so well, it will be foolish to push deep to their backhand. It is best to flip or to flick the ball to reduce the power of their attacks, and then try to get to the rallying phase. R: How do you control your backhand down-the-line shots? K: Primarily it is in the wrist, and then it is the waist. You have to shift your weight also. If you only use your hand, you will not have consistency. Reporter: If you are facing someone whom you have never played before, how would you find out his weaknesses in the shortest time? LGL: First take a look at his racquet and the rubbers he uses. Is it pips-out, inverted or long-pips? Shakehands or penholder, left-handed or right-handed? Keep in mind that your opponent is also not familiar with your style. You should try to play your game, and do the things that you do well; you can then gain the initiative, and can more clearly observe the other’s weakness. If you play passively, by the time you find out about your opponent, you may be well on your way to losing the match. Look at your opponent’s style. Every style has its weakness, so there is a basic way to play against every style, and that’s the starting point. Left-handed players in general do not like to be moved from side to side. Every left-hander is afraid of this strategy, so that’s what you should use. Some left-handers do better than others. If you place the ball to his forehand, and he is strong on that side, then he probably would be weaker on the backhand. If his forehand is not particularly strong, but his backhand is very quick with excellent placements, then his backhand is his strength. Let’s look at the right-handed shakehanders. In general, shakehanders are not as good with short balls, especially those placed to the middle and slightly on the forehand side. They are weaker than penholders in this respect. So this is where you want to attack to create openings. In a forehand vs. forehand rally, the usual line of play is crosscourt vs. crosscourt. When you play backhand vs. backhand, if you feel that you can keep it up, then your opponent is relatively weaker on the backhand. If you feel like you are struggling, then you should try to move the ball to the middle, or to his forehand side. Shakehanders are slower with balls to the middle, so you should try to place balls there, then suddenly attack the two sides. Penholders are usually weak with balls that are wide to their backhand, so they are afraid of placements that alternate from forehand to backhand. In general, try to do things that you normally do well, and test your opponents that way. R: How do you decide what serves to use? LGL: If you are unfamiliar with each other, then you should use your most effective serves. Let’s say you have a good sidespin serve, then that’s what you use first. If you serve your sidespin serve, and you find it hard to open your attack or gain any advantage, then you could try a spin/no-spin serve, or a backhand serve. Some people are good returning side-spin serves, but weaker with spin/no-spin serves. So even though your best serve is side-spin, your opponent may be great in returning that serve. Perhaps he would be weaker returning a different serve, and that’s what you should try, even though that may not be your best serve. R: You normally serve side-top and side-bottom serves, and not many spin/no-spins. Is that true? LGL: Yes. Ma Lin uses the spin/no-spin serve much more than I do, and that’s because we have different styles. Ma is better with opening the forehand attack, and he also has better footwork. In general, when you serve spin/no-spin, the returns are not very high-quality, so it is a little easy to attack. My style is more "vicious", and my side-spin serves have a great range of spins. The opponent has to be very careful with the return. I get more direct points from my serves, but if an opponent handles that correctly, it is very difficult for me to open the attack. R: Our researchers like Dr. Zhang have compiled a lot of statistics on our opponents, and they have come up with analyses of their strengths and weaknesses. They have recommendations on how to return each of their serves, or what strategies to use against them. When you are on the court, do you follow their suggestions? LGL: Those analyses are quite accurate, and are in general very good to have. But you cannot simply rely on them. The exact strategy depends on the players. For example, they have very detailed analyses of Waldner’s style, and in general those match our experiences. But Kong plays Waldner very differently than the way I play Waldner. You can almost say we have entirely opposite approaches. Waldner has good variations, and Kong is very "all-round". So in general Kong would try to play a simple game against Waldner. If out of ten balls, 8 of them are very alike, then Kong would definitely win that match. If out of ten balls, 8 of them are different, then Kong is in trouble. But it is different when I play Waldner. Perhaps out of ten balls, all of them will be different. When the styles are closer, the match depends on who executes better, and who has more pronounced specialties. I first match my strength against his strength, and if that does not work, then I have to match my weakness against his weakness. My weaknesses are my overall skills and power, and my rallying abilities. Those are also Waldner’s weaknesses. Sometimes I have to force Waldner to play his weaker game. So every one is a little different. If Kong were to play a rallying game with Wang Liqin, he would be at a disadvantage. But Kong has excellent feel, and his ability to vary tactics is much stronger than Wang. So when he plays Wang, he has to keep varying the shots. If out of 10 balls, 8 of the them are the same, then Kong would be at a disadvantage against Wang. R: You have very high quality serves. You play pips-out, but tests have shown that your serves have more spin than the average among national team members. Can you share with us your knowledge? LGL: You have to practice a lot on serves, and I also have a little talent in this area. Kong has outstanding skills, and yet his serves are very "amateurish". He could shore up this weakness by developing other skills. He practices serves every day, but his natural talent is less. He also practices his basic skills every day, and he has a great foundation in basics. I feel that I can learn things fast. Partly that is because I like to really study things, and partly it is because I have some talent in understanding spins. I actually practice less on my serves than my teammates do. A lot of my serves I learn from others. For example, if you are not good returning someone’s serves, then you should try to learn his serves. In the beginning, they may not be as spinny, but after a while, you realize that other people are having trouble returning those serves. Perhaps you can now execute those serves better than the original server, and those serves have become yours. Kong probably has spent less time thinking about serves; his time is spent thinking about how to integrate his backhand with his forehand. So each person has his/her own specialty. When I have good serves, I can fully exploit the advantages of my 3rd-ball attacks. Kong may feel that it’s more important to play a solid all-round game. R: When you mix your side-top with side-bottom spins, how do you confuse the receiver? LGL: I use my left arm for concealment, and I also rely on the angle of the blade and faked movements before and after the serve. I hide the contact point in my service with my left arm, and after contact there is some follow-through motion. It is best if the follow-through is the same for different kinds of spins, or if that could appear opposite to the actual spin. That is, after a side-top spin serve, the follow-through should go downwards, like that of a side-bottom spin serve. Or have the follow-through after a side-bottom spin serve look like that of a side-top. I think I can impart the same spin with several sets of service motions. For example, I can serve a side-bottom spin serve by having the follow-through motion go upwards, go downwards, or be stationary. This makes it hard for the receiver to judge spin. When he cannot see the contact, he would judge from your follow-through or fake motions. Some players always finish their side-top spin serves with an upwards motion: that makes it very obvious what spin is on the serve. Some would serve better: the blade will go down again after the upwards motion. Why couldn’t everyone do that? Because some players cannot put sufficient spin on the ball if they were to use a fake follow-through. R: Your serve motion is different from that of other players: you really lower your center of gravity a lot, and you have a large waist twist. LGL: Yes, because the serve is not only a hand motion: it requires the whole body to work together. I focus my whole body’s power into that instant when I contact the ball. If you only use your hand (arm), your serves will be less spinny, and you can easily serve too long when the game is on the line. I lower my center of gravity because the lower you contact the ball, the faster is the serve. But then there is a higher risk that the serve may hit into the net also. R: In 21-point games, the serve rotation is made up of 5 serves. How do you decide which combination of serves to use? LGL: That would depend on who is the opponent, what serves he has trouble with, and what is his tendency in returning serves. If he is not good with flips, then you should serve more side-top or no-spin serves to give yourself more chances to attack. If he has a tendency to flip, or if he pushes worse than he flips, then you should serve more side-bottom spin serves. You should have a set of 5 serves thought out, and sometimes you have to guess what your opponent would try to do. For example, if he receives two serves too long, he may guess that the next one is also a side-top. So you should try a side-bottom spin next. But another player may return your serves the same way, so you need to know his tendency. Let’s say he pushes your first serve off the table. He pushes your second serve again, and it is either long or too high. On your third serve he still pushes it. Then you know that this player is a little stubborn, or perhaps he does not know how to flip. Another player can be quite different. If he pushes your first serve long, he may flip your second serve. You would know that this player likes to vary his shots, and you should mix up your serves accordingly. R: How do you play the critical points? When you are behind 18-20 (21 point games), what would you do? LGL: That depends on what happened on the previous 38 points. I would try to vary my tactics. If I have service, I would generally choose one of two serves: an aggressive serve like a side-top or a deep serve so that I can win the point outright or start attacking the return, or a safe serve like a side bottom with lots of spin. I usually use one of these two serves rather than a neutral serve. R: When you are leading, do you play more aggressively? LGL: That depends on how much I am leading by. In the 21-point games, if I have an 8 point lead or more, I may not use some of my serves. I would save the more effective serves until the next game, so that my opponent would not get used to them. If my lead is small, like 3 or 4 points, then the game is still close, and I do not need to be overly aggressive, since that could lead to errors. If you lose your lead, you would be have more mental pressure. When you are behind, then it is no good to play safe, since if you exchange points with your opponent you would still lose. That is when you need to be aggressive. Your opponent would play the same way, so when you are ahead, you have to stop your opponent’s aggressive attacks. R: Now that we are playing 11 point games, do you have a good feel for the new format yet? LGL: I am still a little unadjusted. In the past I have an established set of 5 serves: after the first two, the next three will almost be automatic. Now that the rotation is made up of 2 serves, I have to rethink my serve-and-attack strategy. When you first serve was returned well by your opponent, there is more pressure on your second serve. R: Have you considered linking several serve rotations together, like maybe 3 rotations? Or are you only thinking about the two serves in a rotation? LGL: I would consider the two serves. Now it is difficult for me to try to link 2 or 3 rotations together, because your opponent’s serves are in between. In 21-point games, if the score is 8-7, you may miss on your first two points, and you can still catch up to 10-10 by serving the next 3 well. In 11-point games, if the score was 7-7 and you don’t serve your two serves well you are behind 7-9. Now your opponent serves, and he can close out the game and you would not get to use the other serves that you might have planned out if you were to link 2 or 3 rotations together. R: You have faced Waldner so many times. Can you share with us your strategies? LGL: This is a little difficult to explain, because you have to be at a certain level before you can appreciate this. Basically we are both familiar with each other’s strategies, but on the court there will be variations. When he changes tactics, or better still, before he changes tactics, it will be great if you can see that right away. Don’t wait till he wins several points, or worse, a couple of games, before you realize what he is doing differently. At this high level, if he has been placing the balls to your backhand, and suddenly he goes after your forehand, that would not be a random change. There would be a reason behind that change; the first time he does that you may not think too much about it, but the second one he does that you should know that he is trying to move to your forehand. In general, if he places several ball to your backhand, and you successfully step around to attack them, you should guess that he will try to hit your forehand. So during a match, the tactics keep changing, and you need to adapt to his changes. R: When you are receiving serves and you cannot tell the spin, would you assume it is top-spin, or back-spin? LGL: If you cannot tell whether it is top or back spin, you lose the point if you guess wrong. So first of all you should try hard to see what spin it is. If you really cannot tell, then you would base your guess on the previous serves. In the last 10 serves, how many did you miss long, and how many did you hit into the net? Hopefully it is not 5-5. If 7 of the 10 were too long, or maybe 5 were long and 2 were pop-ups, then your opponent probably serves side-top better, or more frequently. When you could not see clearly, and you return the serve into the net a couple of times, then you should know that those serves that you could not see clearly are probably back-spin serves. Some players keep returning serves into the net because they don’t try to remember the previous serves. R: The professional players seem to remember serves better. LGL: There are exceptions. Missing several serves in a row is an experience. The younger players may not have this experience. They think that a serve is top spin, and they flip the ball and it goes into the net. Next time, they flip again and the ball goes into the net. You would need to think before receiving. Perhaps the opponent in very good in disguising a back-spin serve as a top spin serve. R: We say that we cannot play to our opponent’s rhythm. We should set the rhythm. How do you achieve this in a match? LGL: First of all I have more tactics, and then my first-three-balls are stronger. So the opponent will play to my 3rd ball attacks. Of course he would try to reverse that. Everyone knows that I am weaker in rallies. But it is not easy to stop my 3rd-balls. The key is serve reception. He would be at a disadvantage if he cannot judge my serves well. Also, I have a tight receive game. If I can seize the initiative then he cannot get into the rallying phase: I would be attacking and he would be defending. Every player is different. A player like Kong or Wang would rather see everyone serve the same way. Out of 10 points, he would have at least one more than what you can win. A player like me would like to put in as much variations as possible. Out of 10 points, 7 or 8 of then should be played differently. I try to confuse my opponents, and make them feel very awkward.